This thesis describes, conceptualizes and explains the division in post-war Beirut, Lebanon based on religious distribution. 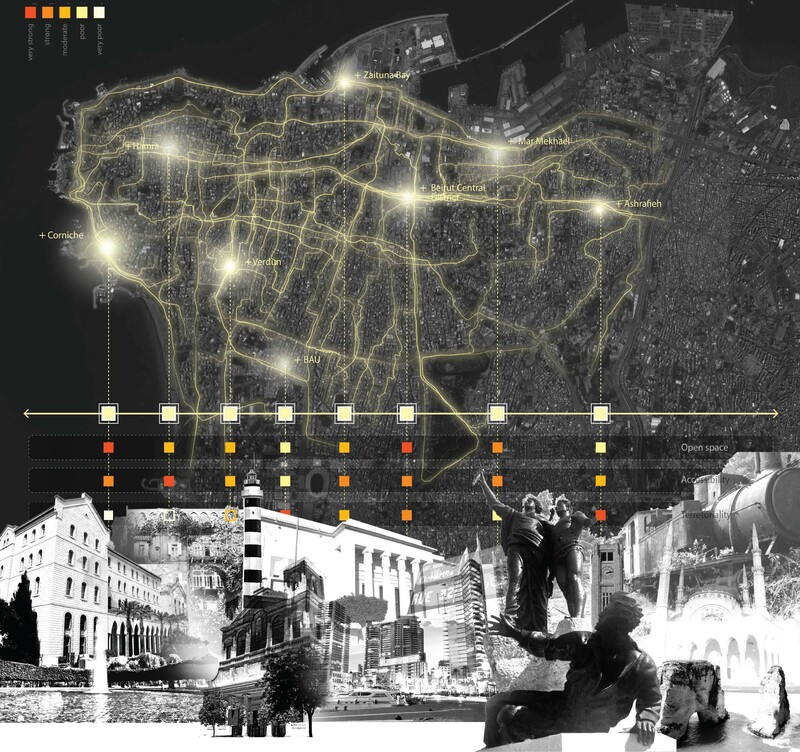 Its main objectives are to contribute to the literature of segregated cities by (1) conceptualizing division practiced by individuals of different religious backgrounds in the post-war city of Beirut, (2) explaining the logic behind this phenomenon of division and revealing the harmony or paradox between perceived, conceived and lived spaces of the city and (3) proposing a spatial intervention that responds to the discussed division, by that introducing a new vision for a sustainable urban strategy in Beirut. A discussion is raised about the relationship between perceived, conceived and lived spaces as per Lefebvre’s analysis of the social construction of space. These classifications conceptualize the condition of the urban fabric and explain the process of transformation the spatial fabric underwent after the Lebanese civil war (after 1990). It goes on to confirm that Beirut is a divided city in the eyes of its own dwellers, later to reveal a hidden reality that affirms the existence of commonalities. In conclusion, this study raises questions related to the role of the planner as a facilitator for a unified community through understanding the harmony among the space/place and culture as tools for social inclusion and generation. Please click here to watch the video “For war, as we have seen, is not just a condition that disappears as soon as it stops, but it is society itself in one of the forms of its organization.” Ahmad Beydoun, What You’ve Known and Been Through, 1990. With the increasing political and security clashes and during the lack of any form of a holistic planning for the city of Beirut, ethnic divisions are escalating and social tensions are growing and intensifying the ethnic loyalties within the framework of a secular national identity. Addressing divisions in Beirut city starting with ethno-religious versus socio-economic distributions, reveal how each of these subdivisions acknowledges a different perception of space based on their collective memory of ‘their city’, and this is highly affecting their spatial practices. 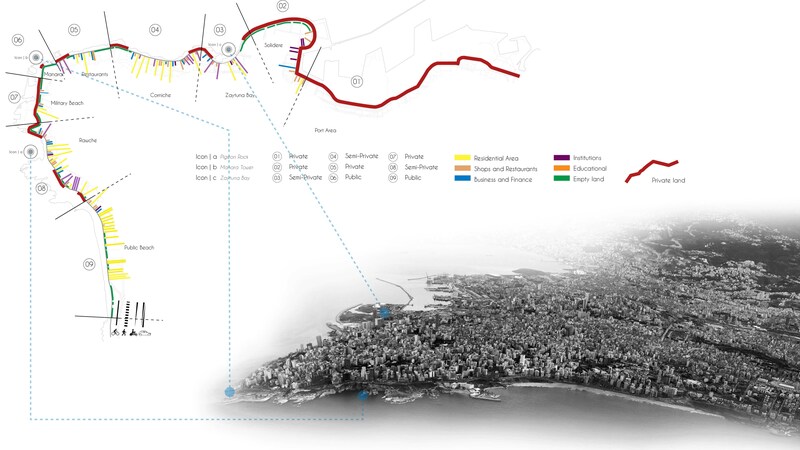 For instance, the one demarcation line (the green line) that divided Beirut during the war has now transformed into a network of lines. Hence, the formulation of the research problem is the following: Individuals have different perceptions of the image of their city. The premises of this research is to achieve a coherent perception of the realities of the city where the image of the city and its spatial practices are acknowledged harmoniously and considered enriching rather than disuniting. The main research hypotheses are as follows: 1. 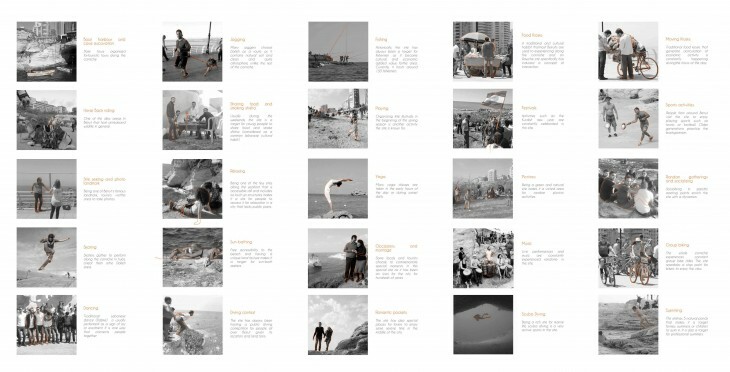 Individuals of different religious communities in Beirut have different interpretations for the image of their city and perceive it based on their various acquired social memories. 2. 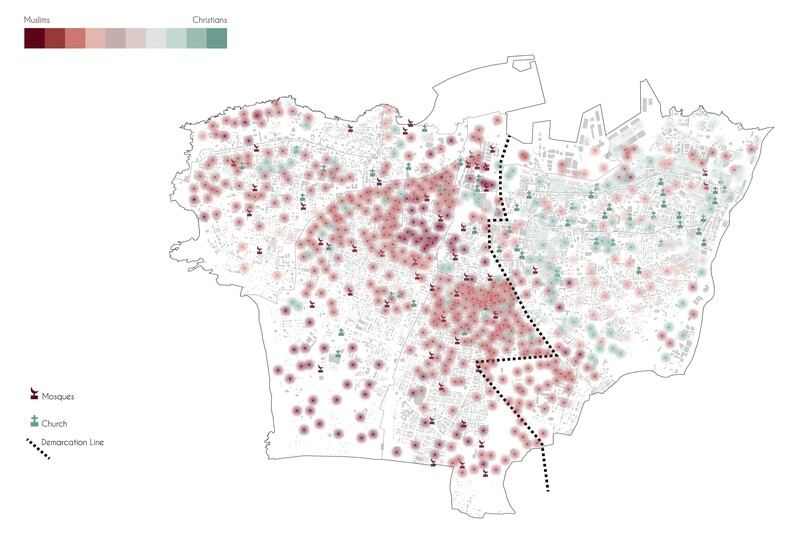 Individuals while divided into various religious communities in the city of Beirut are socially and spatially connected to each other. 3. Urban interventions can strengthen the relations between place and image, preserving with that the specificity of the space and its social collective memory. Below is a matrix explaining a network of connected concepts covering the proposed hypotheses in relation with an elaborate understanding of the spatial classifications of Beirut City (based of LeFebvre’s Classifications). Perceived Space, the space that is a product of human design, urban planning and spatial organization; answers the What question: What urban interventions can strengthen the relations between place and image. 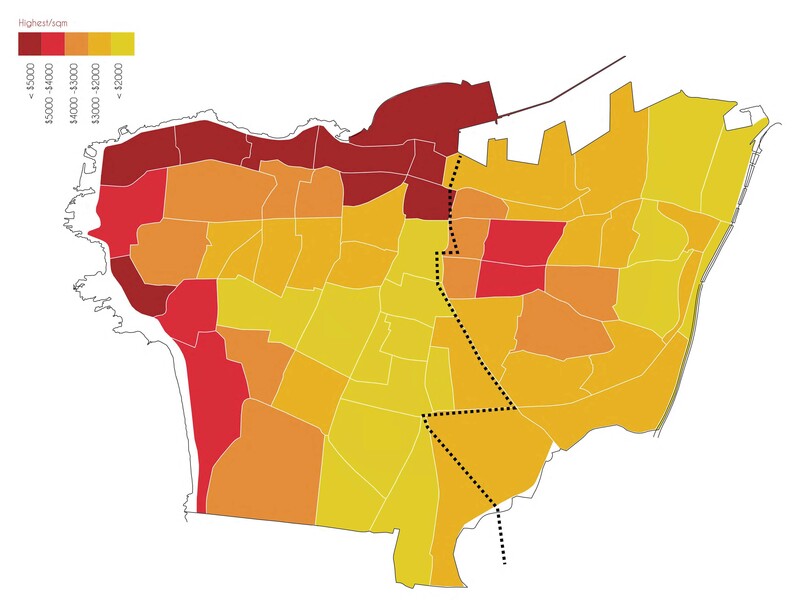 To begin with, this section is based on quantitative analysis of the community’s condition based on (1) identifying the types of divisions inside the city and (2) learning from case studies (urban interventions) that contributed to intensifying or alleviating the mentioned divisions. ||Religious Division. During the Lebanese Civil war (1975-1990), Beirut was divided into East (Christian Dominancy) and West (Muslim Dominancy). The center of the city was transformed into a no-man’s land and a demarcation line was created separating the two parts of the city. In present times, mapping the distribution of churches and mosques with respect to the religious background of the communities evidently reveals how the ‘ghetto phenomena’ remains, whereby the communities still cluster around their representative religious institutions. 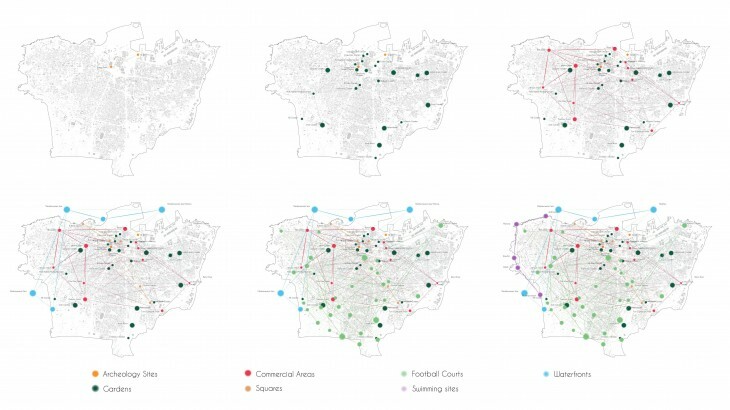 It is also evident the effect of the Green line, which spatially is non-existent yet still reflects a division between the Christian and Muslim communities, on the urban fabric. Furthermore, the creation of new ‘demarcation lines’ between communities in the Western part of Beirut have been escalating after the 2005 events ; distinguishing the different sects in the communities with Muslim dominancy. What had been checkpoints and militia roadblocks during the civil war have now been replaced by subtle division lines that can be experienced by anyone who travels through the city: Posters of different sect leaders, graffiti and other religious and political icons serve the exact same function and give the unavoidable impression of a city deeply divided that echoes Lebanon’s political landscape. Map showing the religious distribution of the communities. Data Source: Doueihy, Y. 2007. The Lebanese 1907-2006. Beirut: Self-Published. – Public Spaces Gentrification: consists of attempting to manipulate the public space into an artificial arena of consumption, prohibit the use of large parks by the public, and the privatization of the public spaces (specifically the waterfront in the case of Beirut). 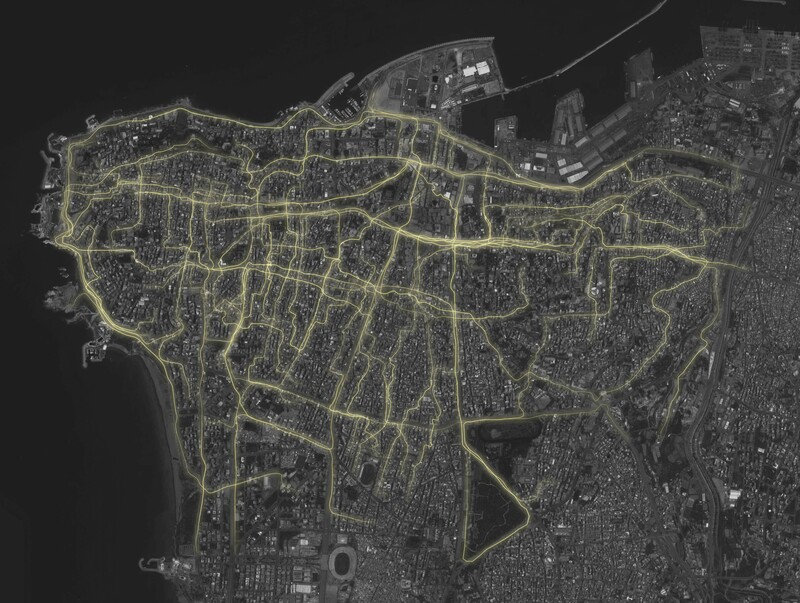 Only 1.8% of the surface area of Beirut is green, this would have to be multiplied by 22 to arrive at the WHO indicator. The city would have to demolish 41% of the built-up area, and transform it into a park, in order to meet the World Health Indicator. A common explanation for the absence of playgrounds, parks and other shared facilities — as much as for the deterioration of the built and natural heritage — is that most properties in Beirut are ‘privately held.’ Given that land is very expensive, it is prohibitive for public authorities to expropriate areas for the development of parks and other shared amenities. Hannah Arendt argues that, a public space reinvented on a policy of amnesia isn’t only a limited public realm but also the gentrification of an entire location of memory into an elitist museum, closing not only the past but also the future. A student interviewed by Craig Larkin expressed it best: “The redevelopment involved a covering or hiding of the memory of the war, and in this sense it’s unreal. You can’t talk just of Romans and Phoenicians and our great heritage, without mentioning militias, kidnapping and bombs.” ||Case Studies. 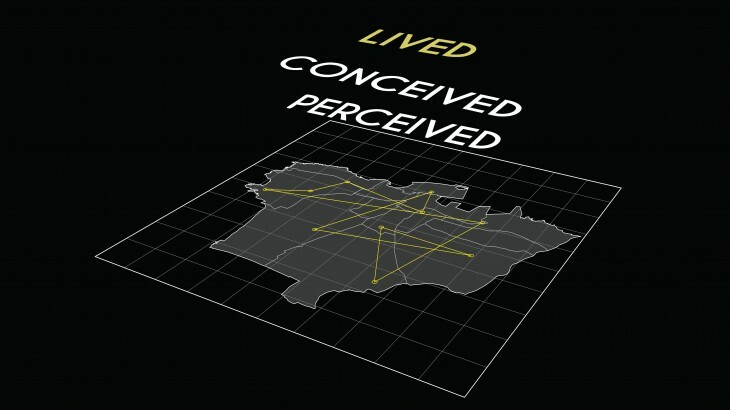 Several Case studies emerge when discussing the Perceived space they are basically of two-fold: Positive Contributors and Negative Contributors: -Positive Contributors: Projects that are either Events or Spatial interventions, contributing to welding the communities together and reducing the above mentioned types of divisions. – Negative Contributors: Projects , specifically post-war reconstruction, that have been implying a reduction of the significance of spatial production to economic profit maximization, prioritized over the social dimensions of the city’s core, such as its religious and class mixity. As a conclusion, it is evident that established Urban interventions, on levels and scales, ranging between master plans to reconstruction strategies to organized events, were responsible for creating further tension and segregation among the different communities in Beirut. This proves that the third hypothesis proposed. Conceived Space, the space that contains the abstract, the imagined space, as well as the visual order, signs, and codes of the city, dominated by political rulers, planners, and economic interests. Based mainly on a qualitative research methodology, this section investigates the image of the city in the mindscape of its dwellers through interviews and observation of post-war generations. 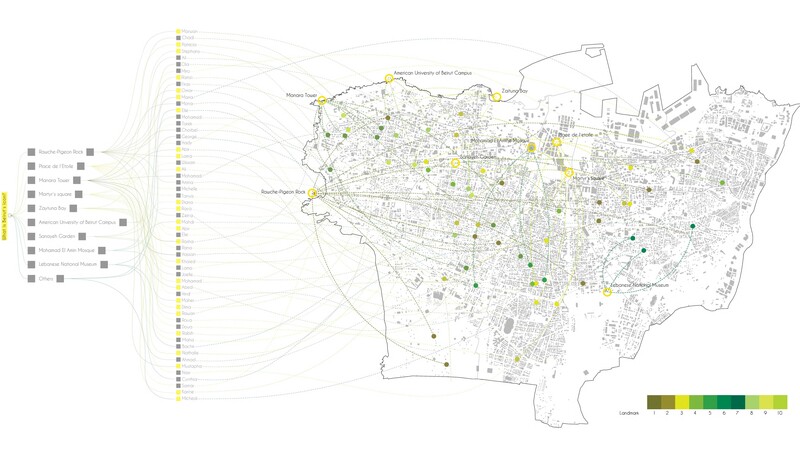 In order to support the findings of this qualitative research, the movement of this category of Beirutis was mapped a pattern of spatial dwellings inside their city was deduced. Literature review supported this section specifically to determine the basic principles that define the conceived space. 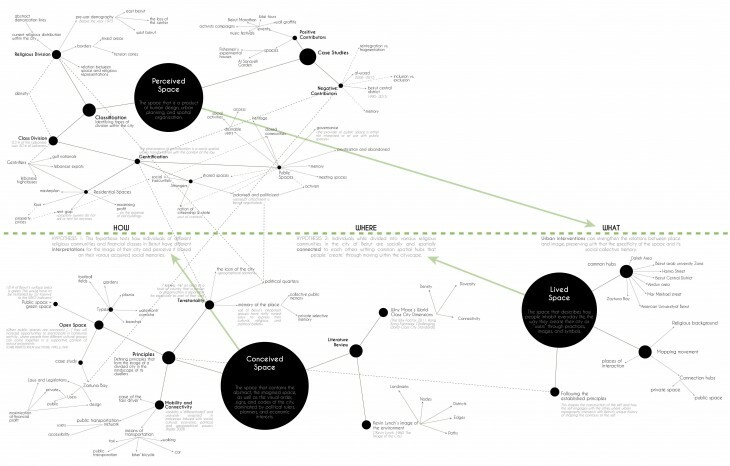 Defining the character of the city through deconstructing the city along Kevin Lynch’s five visual qualities of the city and Winy Mass’s World Class City Dimensions, the following Principles were deduced and later examined: Territoriality, Open Space and Connectivity and Mobility. Observations and interviews with people from different ethnic divisions resulted in determining a collage that defines a set of icons/memorable places that define their city. Furthermore, interviews with taxi drivers helps understand the division through the transportation system hence affecting the spatial interaction inside the city. ||Territoriality: an area of a town or city that a person or organization is responsible for, especially as part of their work. Diagram showing the ten different landmarks and their locations on the map, the dwellers and the neighborhoods they live in. What is Beirut’s Landmark? This was the question addressed to fifty-seven dwellers of the post-war generation who come from different areas/communities in Beirut. The result was 10 different answers for a city that has an area of 20km². After analyzing the answers, the results showed that basically these dwellers relate to the landmarks that are close to their communities (homes, wok place, study place…). As a result, very few share a national landmark to represent the city as a whole. ||Open Space: «When public spaces are successful […] they will increase opportunities to participate in communal activity. This fellowship in the open nurtures the growth of public life, which is stunted by the social isolation of ghettos and suburbs. In the parks, plazas, markets, waterfronts, and natural areas of our cities, people from different cultural groups can come together in a supportive context of mutual enjoyment. As these experiences are repeated, public spaces become vessels to carry positive communal meanings». 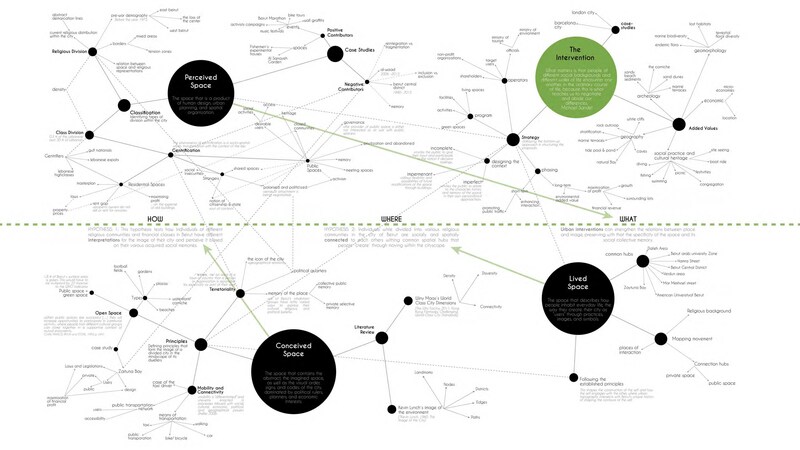 (CARR, FRANCIS, RIVLIN and STONE, 1993, p. 344) Mapping Public Spaces inside the city explains the concept of conceived space in terms of a network effect that normally acts as a link among the different neighborhoods of the city. 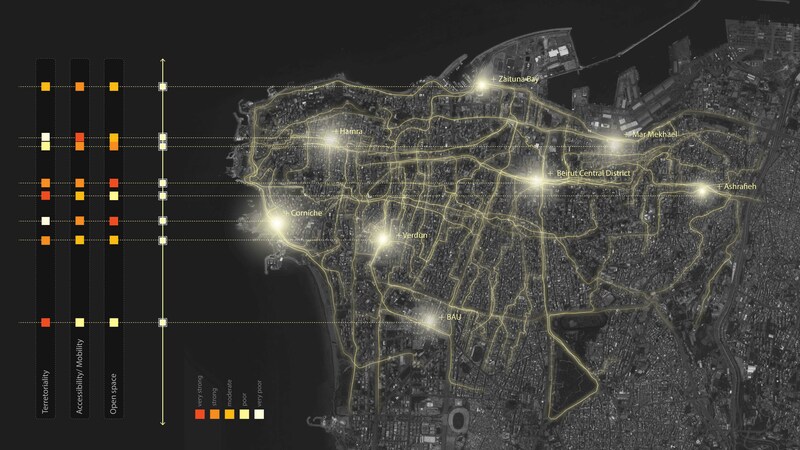 ||Mobility and Connectivity: «mobility is “differentiated” and unevenly enacted in processes imbued with social, cultural, economic, political, and geographical power». (Sheller, 2006) An experiment was performed on taxi cabs in Beirut that represent a major transportation tool around the city. 11:35 a.m. After 20 attempts to catch a cab, -10 from destination A to B, in 7 minutes, 4 attempts failed (2 were sarcastic), 3 asked for extra charges, 3 accepted. -10 from Destination B to A, in 11 minutes, 3 attempts failed, 5 asked for extra charges, 2 accepted. As a conclusion, and based on the three discussed principles, it is evident that the city is divided in the mindscape of its dwellers. This confirms Hypothesis nb. 1: How individuals of different religious communities and financial class in Beirut have different interpretations for the image of their city and perceive it based on their various acquired social memories. Lived Space, the space that describes how people inhabit everyday life, the way they create their city as “users” through practices, images, and symbols. Map showing the 45 tracks mapped by the dwellers moving inside the city. 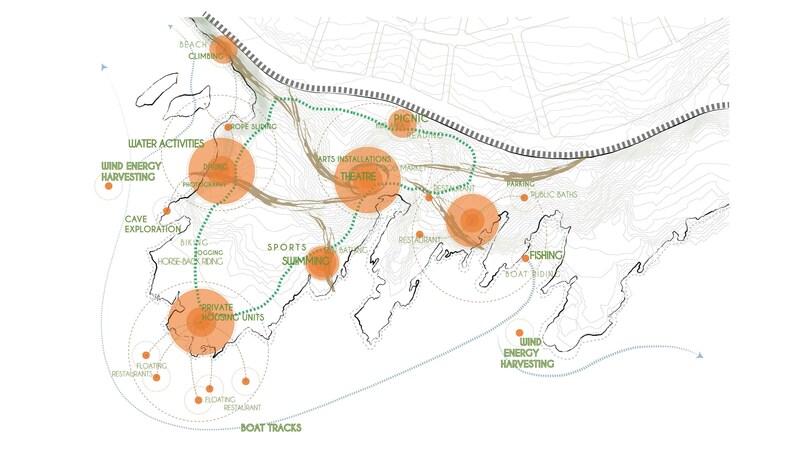 Diagram identifying 25 forms of spatial uses: Boat harbours, cave excavation, horse-back riding, site seeing, skating, dancing, jogging, sharing food, relaxing, sunbathing, diving, fishing, playing, yoga, occasions, romantic pockets, food kiosks, festivals, picnics, music, scuba diving, playing sports, socializing, group biking and swimming. “Public spaces in cities define the protocols for cohabitation used by a community to build a society. It is the place where code lines for social interactions are written, where the culture of belonging and of urban identity is created. It is also the territory that houses the infrastructures making a city operate.” (Guallart, 2006). Nevertheless, like everything else that is given, not earned, these spaces will not be sustainable if not built through the work of their people. In order to achieve a sustainable shared space that promotes communal behavior for the public users and generates financial revenue for the shareholders, the proposed strategy extends over several phases that ensures a long-term consistency. The context of this project is based on comprehensive thinking in order to design a context for human interaction based on three major principles: – incomplete context which invites the public to give their input and participate in the notion if decision making. – temporary context which allows flexibility and possibilities of future modifications of the space through building with lightweight deployable structures. – indefinite context which invites the public to relate to the character, history and memory of the space in their own personalized approaches. 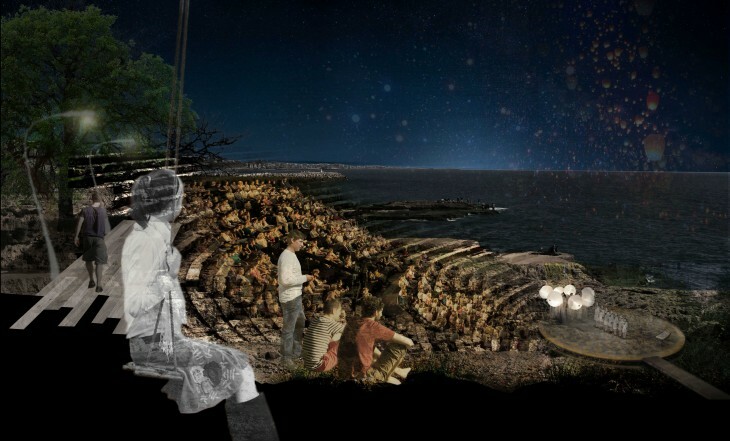 Therefore the project’s aim is to empower the concept of sharing through innovative interactive spatial interventions ensuring in parallel eco-friendly and environmentally sustainable standards. 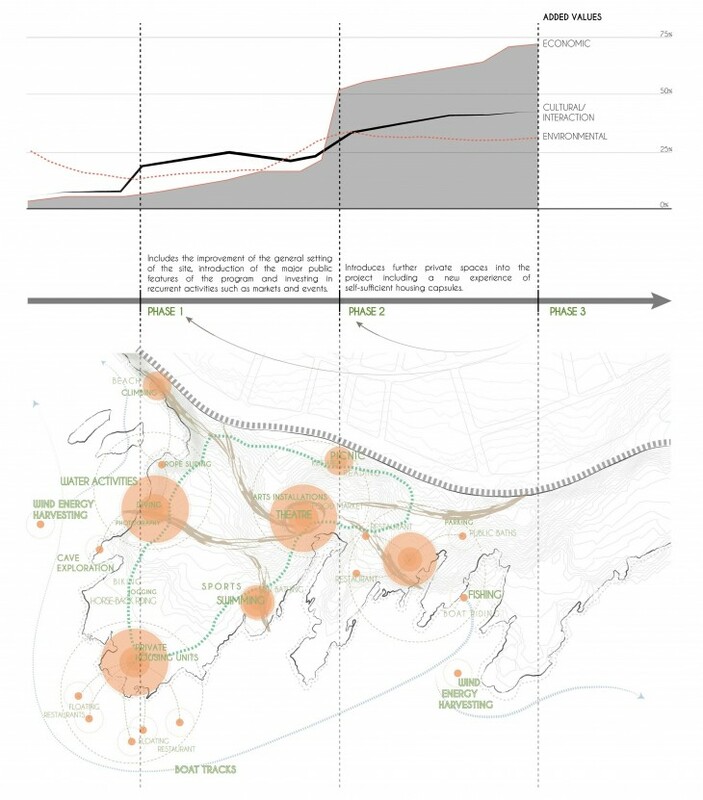 Activating the space: This phase extends along the first year of the project’s initiation and targets high sustainable traffic to the site with little necessity for monetized caliber of users. This will grow the trust of the public as they experience a new form of spatial innovation unseen before in Beirut. On the other hand, the private investors in the project will not be dedicating high initial capital to kick off the project. 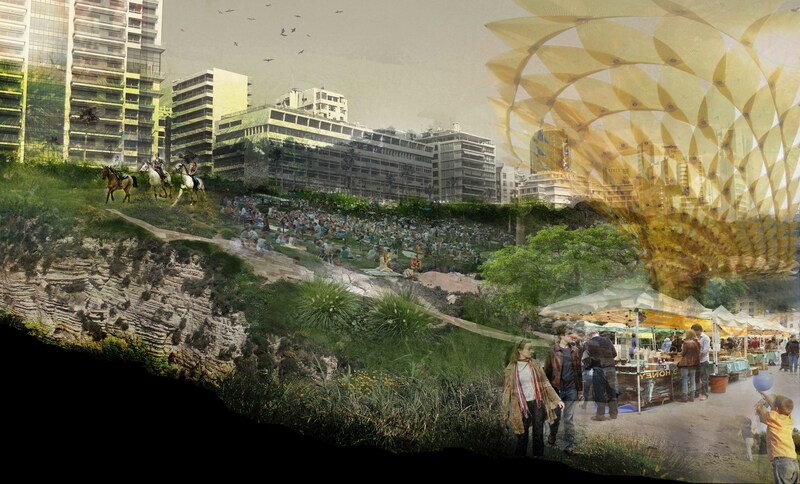 On the level of the architectural intervention, this phase includes the improvement of the general setting of the site, introduction of the major public features of the program and investing in recurrent activities such as markets and events. The time factor is critical in this case, as it allows the public from different backgrounds, to gradually get acquainted to the concept of shared space until they become eager to improve this space and eventually care for the common good. The actors involved in this stage are: – the shareholders who will ensure the site management and receive the financial revenue as well as coordinate with the governmental officials. With that, they will be eventually promoting themselves as socially responsible private developers. The source of the revenue generated will be through organized events, classes, and access to specific facilities. – the public users from different age groups, social and economic backgrounds will be the incubators of the space themselves. The targeted interaction among them is the first aim for ensuring the sustainability of the project. – the official party which includes the Lebanese Ministry of Environment and Lebanese Ministry of Tourism. The first controls the norms of the built structures and guarantees that no damage is endangering the ecosystem. The latter performs control over the touristic activities happening on the site. – the non-profit organisations (in this case recommending Civil Campaign to Protect the Dalieh of Raouche along with other organisations committed to research on ecological diversity) that contribute to on-going research on the preservation of the ecosystem in the site as well as implemented innovative self-sufficient strategies and experimentations (energy generation through wind energy, solar power, and algae). 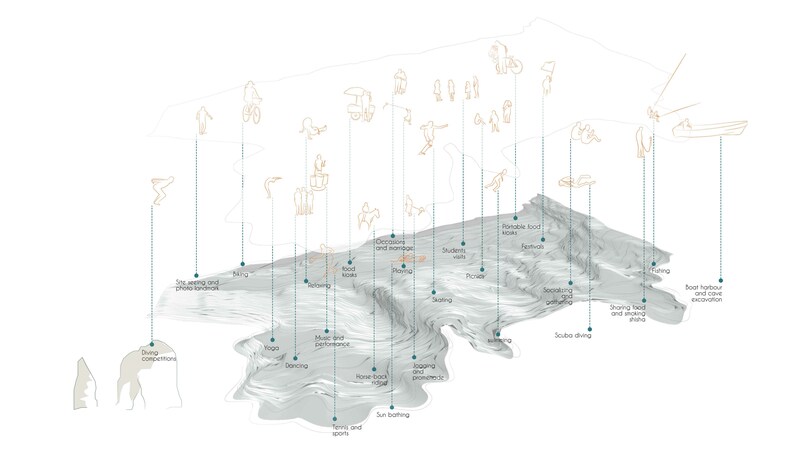 Maximizing the interventions’ returns: This phase introduces further private spaces into the project including a new experience of self-sufficient housing capsules. The limitation of space development remains the exploitation factor based on the existing zoning regulations which is 20% for Zone 10 IV while Zone 10 III remains considered as non aedificandi. 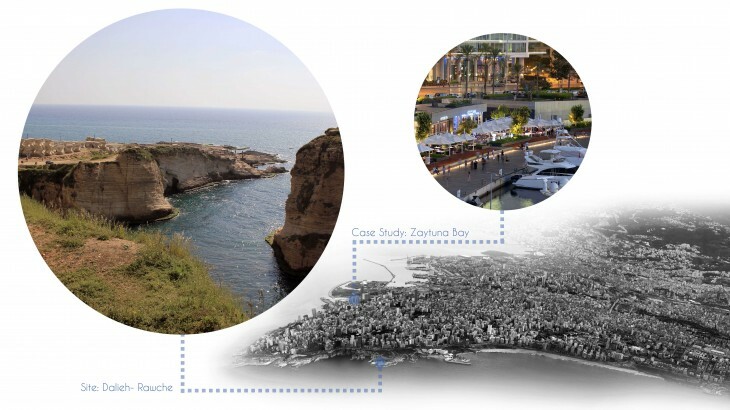 The proposal’s agenda clearly invites all actors to take role in the inclusive urban regeneration of Dalieh focusing on major target added values on the economic, social and environmental levels and therefore contributing to urban connectivity. Fishermen for instance, who have been working on the Dalieh site for a long time, are invited to share their experience with tourists, generate additional economic revenue, and keep their businesses which now has become part of the traditional heritage of the site. Dalieh, as a shared space, is a vital ingredient in the success of a united Beirut, helping build a sense of community, civic identity and preserve cultural heritage. These facilitate social capital, economic development and community revitalization, where the public realm has a say in decision making (bottom-up approach), and where environmentally sustainable design, social interactions from different calibers of the society are encouraged. In conclusion, the three layers of realities in Beirut city: the Perceived, Conceived and Lived realities, are translated into spatial conditions yet with different intensities. The Perceived and conceived spaces are directly affecting the dwellers perception of the city and time factor is limited to the nostalgia of the past in their mindscape. The lived reality, although being positively affecting the connections and interaction processes between the different communities, is not vastly promoted. This paradox is explained by Lebanese architect Bernard khoury: ‘An Ancient City for the Future’, because ‘it evokes and links the past and the future, but shrugs off any notion of the present’. The proposed strategy aims for creating a network of sites of opportunities that influence each community and emphasize the necessity for sharing these spatial incubators or attractors towards a socially sustainable urban strategy for Beirut City.